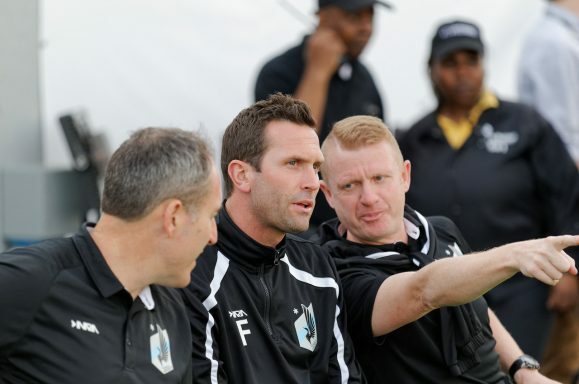 During the Loons’ brief mid-season break, they will be looking to regroup and fill out their roster for the fall. Both Carl Craig and Manny Lagos bemoan the frustrating injuries that caused the team to be without players like Ben Speas, Jeb Brovsky, and Bernardo Añor during portions of the spring season. Without Speas and Brovsky, Craig points out, the team lost matches. “I need bodies to fill out the squad because right now we’re short in numbers,” he says. Another player set to come in on trial is Jobi McAnuff, a Jamaican international (born in England) who started on the left wing for Jamaica in the Copa America. McAnuff has played for several English clubs, mostly in the Championship, though he did feature extensively as captain during Reading’s 2012-2013 Premier League campaign. McAnuff is an intriguing prospect because of the Loons’ weakness on the left wing. New signing Lance Laing has had a frustrating spring and Carl Craig has cycled between him, striker Stefano Pinho, and now-injured Añor out left. If Laing continues to struggle, McAnuff could lock down a position that Craig desperately needs to both defend and attack. From the beginning, Craig has emphasized his desire to see a fast, attacking style of soccer, but he says to have that you need a spine. He also teased that there may be a need for a formation shift from the 4-2-3-1 (or 4-4-1-1 depending on who you ask), to perhaps a 4-4-2 with a diamond midfield. But again, he says, that requires someone to cover ground and hold the base of the midfield. Any potential signings come also as teams around the NASL have started bringing the mid-season transfer window to a boil. Kicked off by Richie Ryan’s big money move to Miami FC, the Floridian NASL teams in particular seem intent on righting their ships with proven NASL talent. This means more and more calls looking to see if players are available. Loons players have not been exempted and there appears to be interest in both Pinho and Kevin Venegas. Lagos insists that inquiries from clubs are “common place.” In any event, a move away for Venegas would be highly unlikely without breaking someone’s bank, and losing Pinho would leave the Loons with only one out-and-out striker. All this is to say nothing of pending signings for MLS, which would require separate contracts. None of those decisions can be made until MLS announces the Loons can join the league in 2017. And that can’t happen until Minnesota has a stadium deal. And that can’t happen until Governor Mark Dayton and Minnesota Speaker of the House Kurt Daudt can agree on a special legislative session where they can fix the bill that contains, among many other things, the approval for the stadium land-swap. Lagos says he’s comfortable working under their current conditions, but he will find it difficult to sign players who can make a difference in his team if he doesn’t know whether the team will be in NASL or MLS next season. A player like Jobi McAnuff would likely cost a hefty salary, something much easier to stomach if the team knows it will be bringing in MLS-levels of revenue.